It’s important to be running the latest update of ScanLister. That way, you will be using the latest and greatest features. Plus, if there are any bugs, they will most likely be fixed in the latest version. Go to the account button on the bottom right of the main screen. Then click on check for updates. Follow the instructions from there. 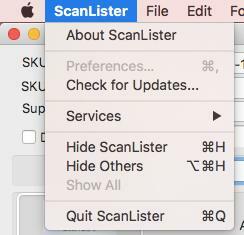 Go to the top left of your screen and click on ScanLister.